The Grotte di Castellana is a series of caves in the Itria Valley that began to form over 90 million years ago. During the Cretaceous period, the valley was submerged by an ancient sea. For millions of years the lifeforms (shellfish and marine plants) left their carcasses on the sea floor and shaped a large deposit of mud and sand. From 65 million years ago, a thick layer of limestone began to emerge and give shape to Puglia. As the land emerged from the sea, an underground level formed where filtered water from heavy rainfall produced an underground river. This event caused erosion which dissolved limestone layers creating corridors and large spaces. Over time, the natural shifting of the tectonic plates caused deformations in the limestone and created part of the Murgia. The water that flooded the underground cavities eventually led deeper into the underground and left large spaces and corridors. Some of the limestone layers eventually collapsed due to fractures and lack of pressure from the deluge of water. This big breach at the top of the cavern allowed a little bit of the sky and a warm beam of light to shine down into the largest cavern, The Grave. Around 2.5 million years ago, the slow trickle of calcium carbonate storm water helped to beautify the caves. This water began to fall and deposit tiny crystals on both the vault and on the ground which caused the growth of stalactites from the ceilings and stalagmites up from the ground. As time progressed, some of these stalactites and stalagmites eventually conjoined to form gigantic columns. These geological events also caused the creation of other magical shapes in the cave system. Over time, the breach in the top of the cavern caused many animals to fall into The Grave. The smell of these rotting animals drew many of the early settlers to the area. Due the smell and the all-encompassing darkness in the cave, many of the early settlers believe that this was the entrance to the “gates of hell” and they were afraid to continue exploration of the area. It wasn’t until Janaury 1938 that Franco Anelli and Vito Matarrese began to explore the Grotte. While exploring The Grave, the explorers spotted a corridor that entered the darkness. When Anelli ventured inside the cave, he found a partially obscured passage that led him to a cavern. Eventually the two explorers would discover other caves and passages that would expose more wondrous caverns and natural statutes formations. Visitors to the Grotte can take one of two tours. The short tour is a little over a half mile long and takes about 50 minutes to complete. This tour includes viewing The Grave, the Pillars of Heracules, the Black Cave, the She Wolf, the Cave of the Monuments, the Angel’s Corridor, the Cave of the Owl, the Nativity, the Cave of the Precipice, the Cave of the Source, the Little Paradise, and the Cave of the Altar. The longer tour is approximately 2 miles long and takes 2 hours to complete. In this longer tour, visitors experience all of the aforementioned sights and then visit the Corridor of the Desert, the Eccentric Stalactites, the Cathedral of Milan, the Madonnina, the Wide Cave of the Reversed Column, the Lake of Crystals, the Red Corridor, the Cave of the Dome, the Canopy, and finally, the beautiful White Cave. These sites create an amazing scenario made of stalactites, stalagmites, concretions, incredible shapes, fossils, crystals, canyons and caves. Our tour began at The “Grave,” the first and biggest cave of all the caves. This is 100 meters long, 50 meters wide and 60 meters deep. It is the only cave with external access and the only cave that tourist are allowed to photograph; the other parts of the Grotte are copyrighted and no images were allowed without authorization from the owners. This huge cavern has a natural skylight which is surround by oak trees, through which a ribbon of clear sky is visible. Sunlight beams through this hole in the ceiling and cascades through the darkness to illuminate different features in the cave. The sunlight at different times of the day creates a huge white screen on the descending walls, gives life to a stalagmite group known as the Cyclopes and eventually illuminates the dark floor of the chasm. The cavern also includes green moss-grown columns, which are encased in darkness all day. Another special delight of the Grave is that it is sometimes used as a performance space. The cave has been outfitted with lighting and audio equipment. Part of the natural rock formation is utilized as a stage. Plays, such as Dante’s Inferno have been performed in this section of the Grotte. It would have been really interesting to see a play performed in this space, but alas, it was not to be. 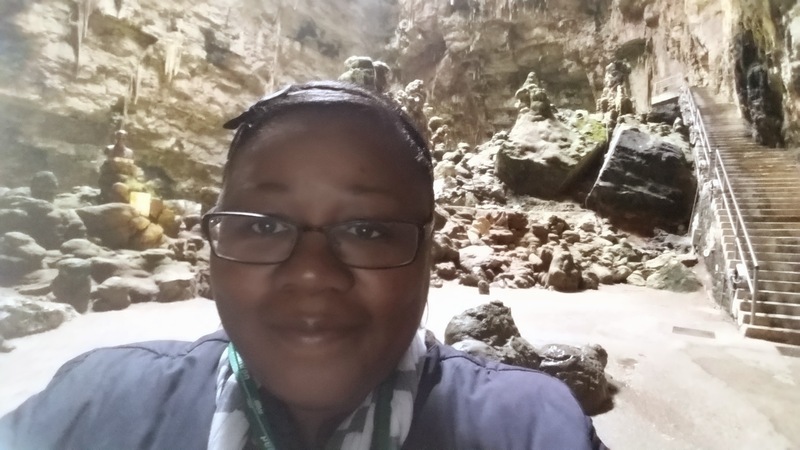 Despite not knowing what to expect when I signed up for this excursion and my fear of anything to do with spelunking (cave exploration), I really enjoyed this tour. There were moments when I was scared but I powered through and I am glad that I got to experience this amazing natural wonder. There have been many new trends in the culinary arts. One of these trends that is taking off in southern Italy is the trend of “agriturismo.” Agriturismo, or agritourism as it is known in the United States, includes any agriculturally based operation or activity that brings visitors to a farm or ranch. In Italy, agritourism is a style of vacationing in a farm house where the guest can partake of food that is prepared from the raw materials produced on the farm or locally. Some locations also allow guest to participate in the activities on the farm, thus allowing them to participate in the preparation of the food and hospitality that they will later receive. 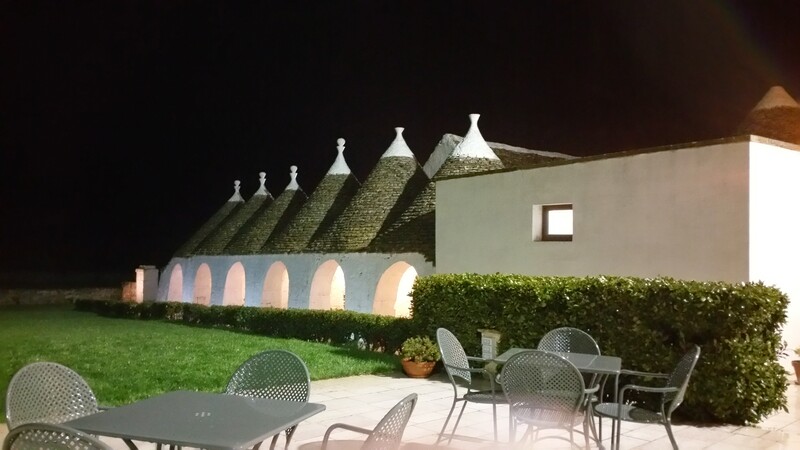 My first experience with agritourism was at the Masseria Papaperta in a trulli near the Grotte di Castellana. As we approached the farm, we were exposed to a beautifully landscaped farm and architecturally stunning farmhouse. 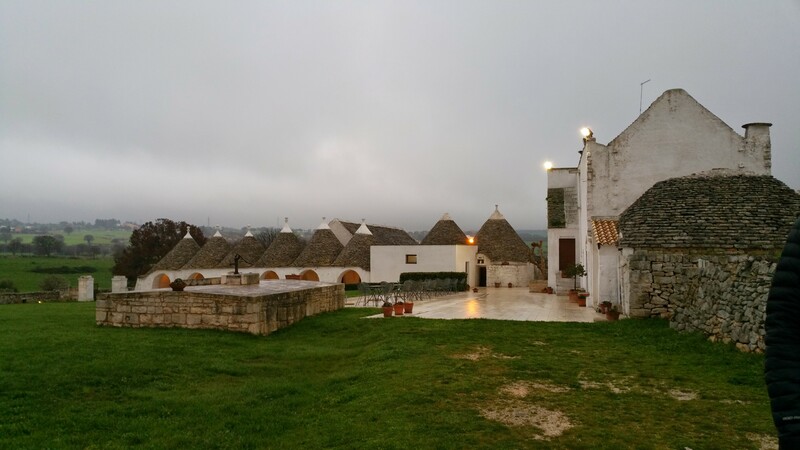 The main building was a combination of new and old; part of the building the original building on the land, while the majority of the building was a newer multi-room trulli. As I explored the building, I came across many nooks and crannies: a private dinning room, a giant wheel barrel in a cavernous room, a room with an old well and pump, an old rusty bike leaning against a wall, and many other interesting surprises. 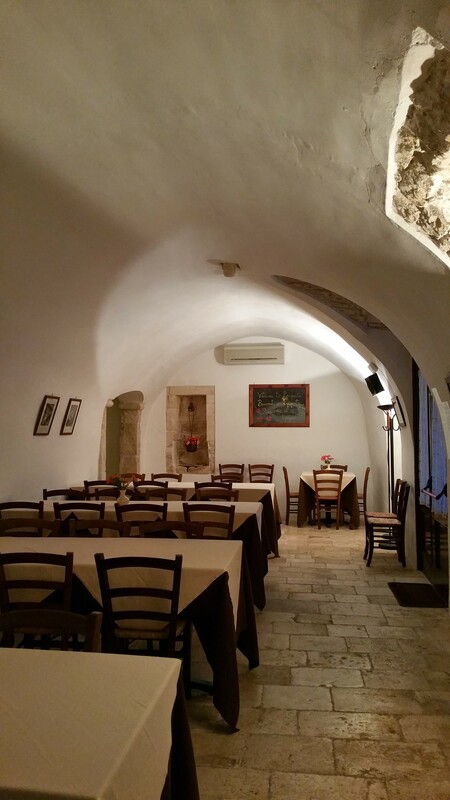 The inside of the Masseria is very simplistically designed with tables and chairs. The real star of this masseria was the food. The first course was bruschetta with tomatoes, zucchini and olive oil. The next two courses were cheese: a grilled cheese topped with spinach and nuts and a trio of cheese which included a burrata, a buffala, and another type of cheese. The grilled cheese with the spinach was my whole world for a few minutes; it was absolutely delicious. 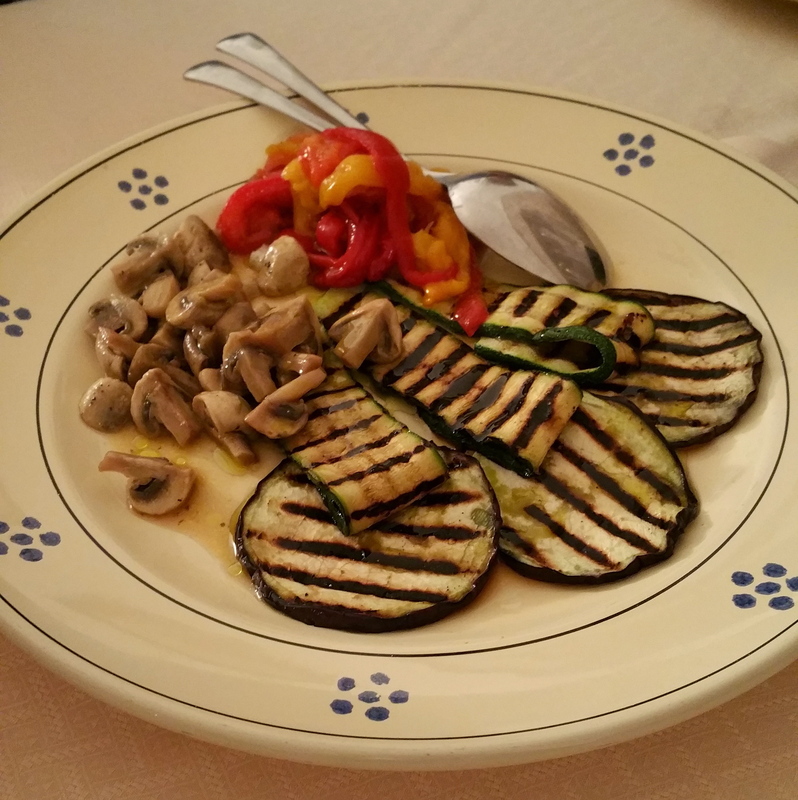 There was a course of grilled zucchini, mushrooms and red and yellow peppers. 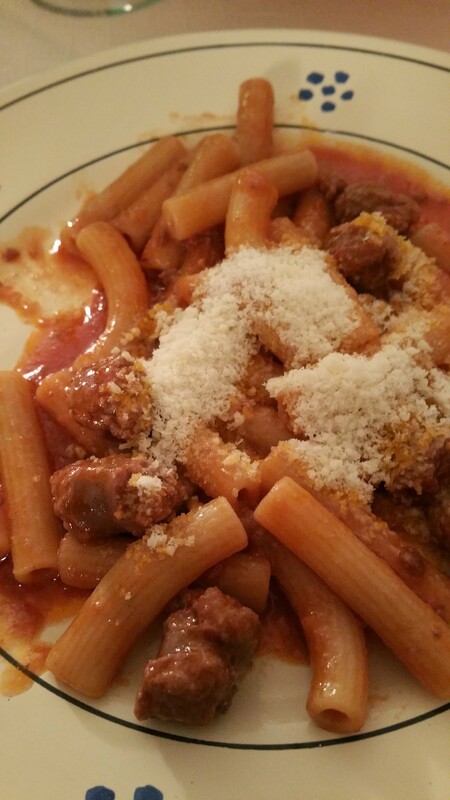 The next course was a penne or rigatoni course with sausage. Yummers! The next course was my favorite. 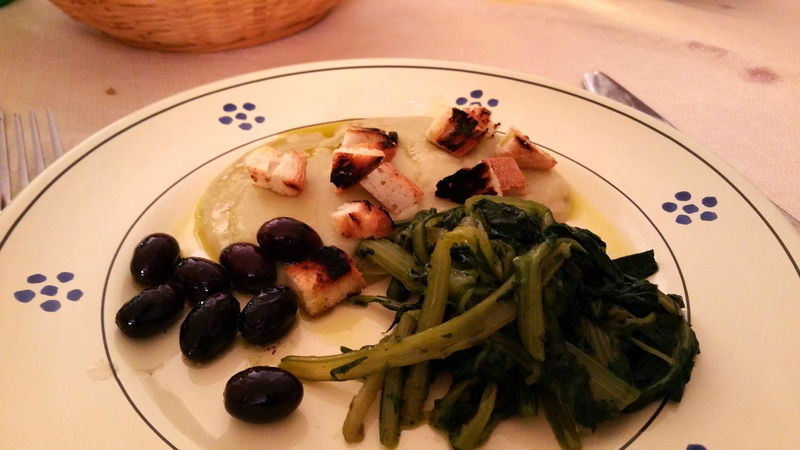 The plate was made up with ground fava beans puree topped with grilled bread, olives, and a type of greens. The fava bean puree was like heaven on a plate. It was simple and absolutely delicious. The final course was a fruit plate with melons and strawberries. I also couldn’t pass up the chance to experience and italian cappuccino. As we left the masseria, night had descended over the farm. The masseria with its lights on reminded me of a warm and welcoming beacon in a dark place. This meal was a fitting end to a wonderful day of exploration of both the physical (the Grotte) and the sensual (the Masseria) worlds.